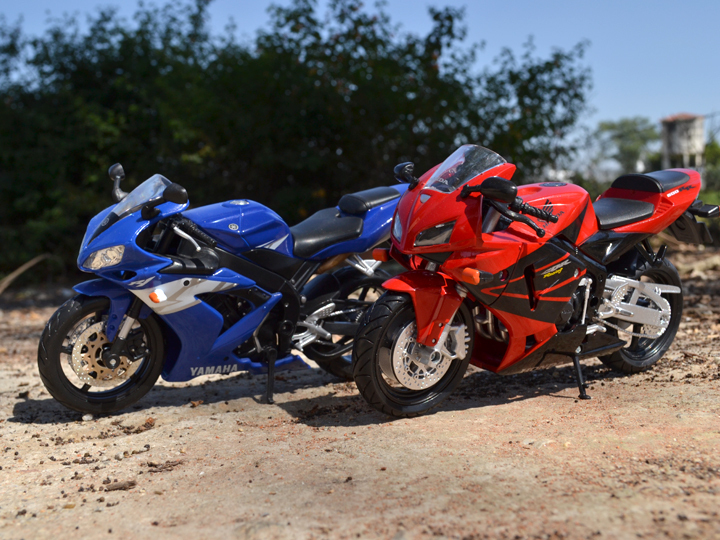 What does a Yamaha R1 and Honda CBR600 have in common? 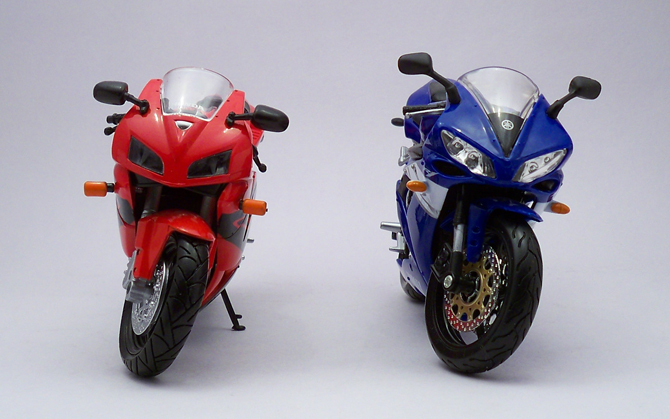 Actually they both a sports bike! apart from this they dont have much in common. The R1 is powered by a 998 cc liquid-cooled, 20-valve, DOHC, inline four-cylinder engine producing under 180hp, on the other hand CBR600RR is powered by a 599 cc liquid-cooled, inline four-cylinder engine producing around 120hp so they have nothing in common underneath. But they both are sport-bikes with umber cool looks, sharp sleek graphics right from the racing predecessors, under seat exhaust etc. 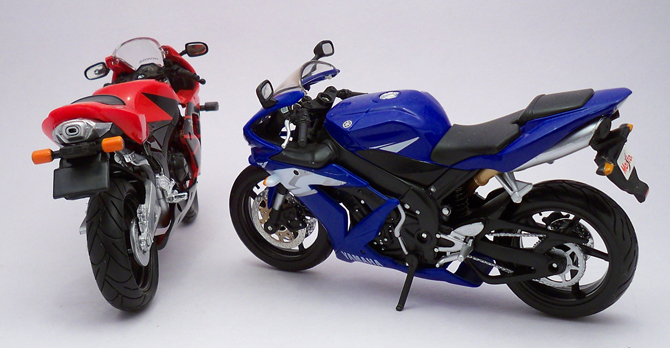 So they work just well in our diecast comparison as they both are in a same scale. Both these bikes are exceptionally good in their very own bandwidth. But Maisto’s feel is way more superior! thanks to the added weight and premium packaging which is a breeze to unbox. 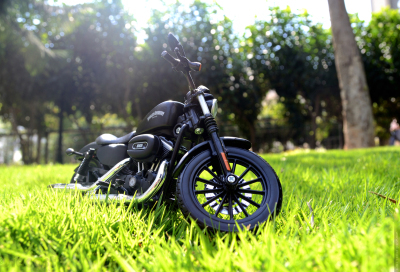 NewRay on the other hand does with a regular package which reauires some effort (more chances of breaking some small parts) but they release lot more models than anybody in the bike segment, which adds up their credit. Maistos approach is details and better quality for a bigger market share but NewRay takes a bigger pie just by give more items on the plate. You can’t makeout any difference if placed in two different corner but the game flips to Maisto if parked next to each other. Opticals like head lamp, tail lamp, turn indicators works in favor of the Maisto. 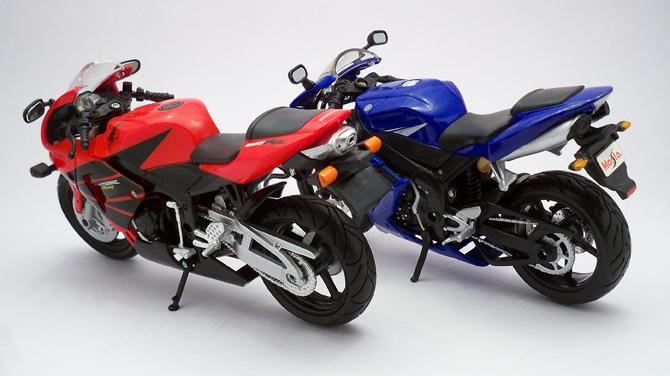 The Honda seems shorter and skinner than Yamaha but in real world R1 is more compact than this Honda. NewRays tire treatment on the Honda is much better than that Maisto. 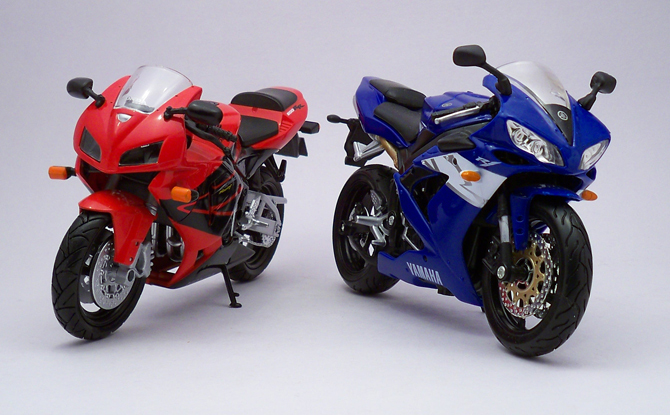 Both Yamaha R1 and the Honda CBR600RR comes with sharp bodywork, aggressive graphics and sleek profile, the diecast scale model here are just shows every single characteristic brilliantly. The decals on the Maisto are a little flat but upto the scale but the NewRay effort on the decals is a bit over scaled but very sharp and almost smudge free down the corners. 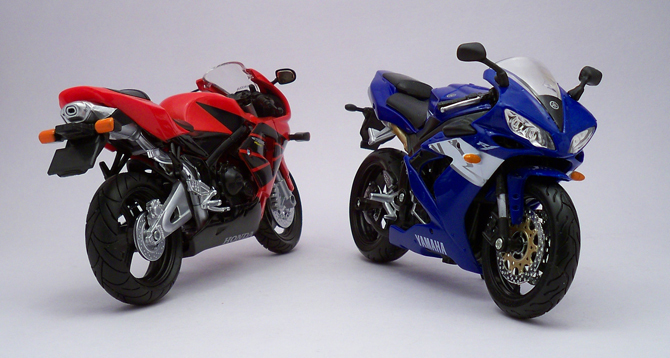 Paint finish goes to the Yamaha as well as it show up a little gloss like the real. 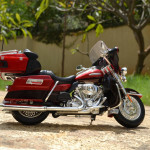 The Maisto’s R1 is packed with features like the side stand, working steering, functional rear suspension and rubberized tire. 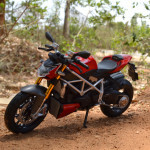 NewRay also answers the Maisto with same features less the rear suspension but the front disc are chunky and dont look real like. Both the bike have this issue of gap between the foot peg and gear lever which is a mile and almost not reachable. Maisto Yamaha’s rear foot peg is ultimately toyish and losses to NewRay here. Tallying all the scores, the verdict is very clear – Maisto takes the checkered flags with ease! NewRay got to do more than variety to take on the budget battle. 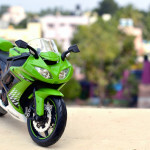 i wud surely go for new ray over maisto..coz new ray engines are better detailed,front fairing is divided into 3 parts nd not just one full chunk of plastic like maisto…r1’s tank is not acurate,maisto chains are very thin nd not very well detailed..tends to break if pressed a bit hard,the disc is very thin nd chrome nd it really looks horrible,no gaps between the read foot peg(no gap between the V)…though new ray rear tyre is thiner,no rear suspension nd bad rear view mirrors…i wud still go for new ray. 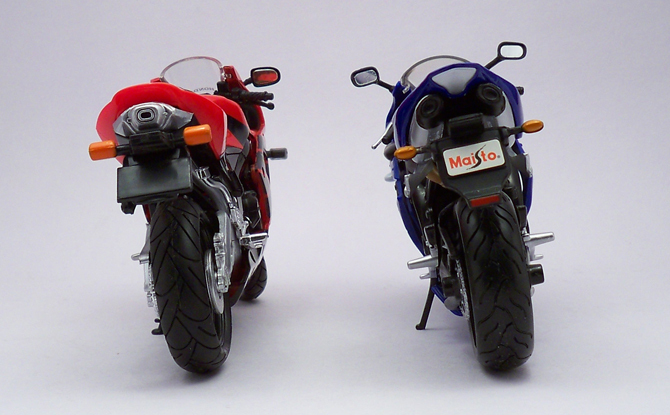 Maisto bike are nice as per my view because of some more extra care onto fine details! But not all Maistos are good and NewRays are bad!! 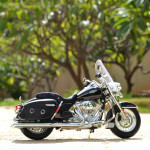 anyway this is an endless debate..i would be waiting for more bikes..
is there any chance where i can share my bike collection over here..
Or Join some diecast forum like http://www.scalemodelcarz.com, or http://www.diecastxchange.com or diecastinternational.freeforums.org which will sure expand your horizons. Its a 1:12 scale, Buddy!